Thank you for your participation in the 37th DASC! We look forward to seeing you in 2019 in San Diego, California! 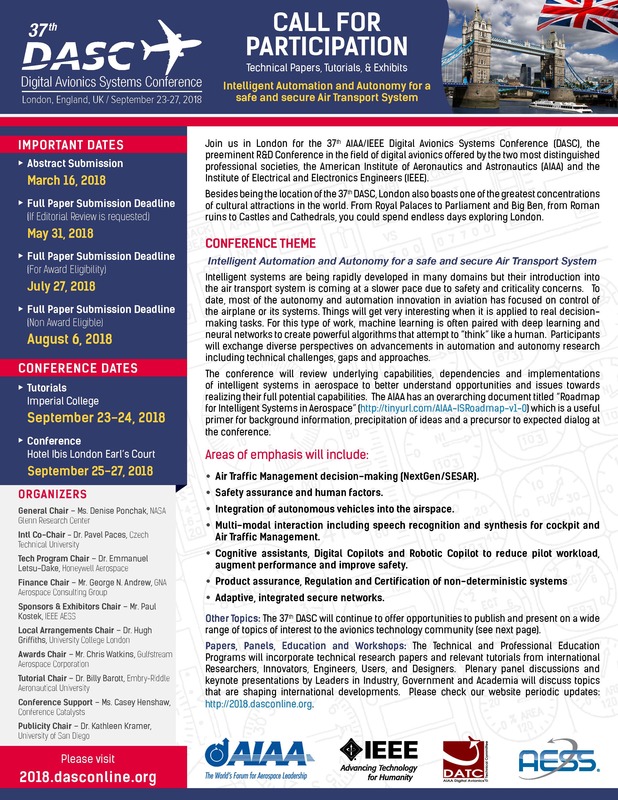 Join us in London for the 37th AIAA/IEEE Digital Avionics Systems Conference (DASC), the preeminent R&D Conference in the field of digital avionics offered by the two most distinguished professional societies, the American Institute of Aeronautics and Astronautics (AIAA) and the Institute of Electrical and Electronics Engineers (IEEE). Besides being the location of the 37th DASC, London also boasts one of the greatest concentrations of cultural attractions in the world. From Royal Palaces to Parliament and Big Ben, from Roman ruins to Castles and Cathedrals, you could spend endless days exploring London. Intelligent systems are being rapidly developed in many domains but their introduction into the air transport system is coming at a slower pace due to safety and criticality concerns. To date, most of the autonomy and automation innovation in aviation has focused on control of the airplane or its systems. Things will get very interesting when it is applied to real decision-making tasks. For this type of work, machine learning is often paired with deep learning and neural networks to create powerful algorithms that attempt to “think” like a human. Participants will exchange diverse perspectives on advancements in automation and autonomy research including technical challenges, gaps and approaches. The conference will contribute to the acceleration of technology development and implementation of intelligent systems for a more efficient and safer air transport system. The conference will review underlying capabilities, dependencies and implementations of intelligent systems in aerospace to better understand opportunities and issues towards realizing their full potential capabilities. The AIAA has an overarching document titled “Roadmap for Intelligent Systems in Aerospace” (http://tinyurl.com/AIAA-ISRoadmap-v1-0) which is a useful primer for background information, precipitation of ideas and a precursor to expected dialog at the conference.